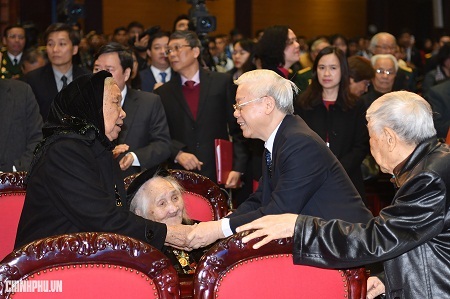 A ceremony was formally held in Ha Noi on January 4 to celebrate the 40th anniversary of the victory of Viet Nam’sSouthwest border defence war and the joint victory of Viet Nam and Cambodia over the genocidal regime (January 7, 1979-2019). 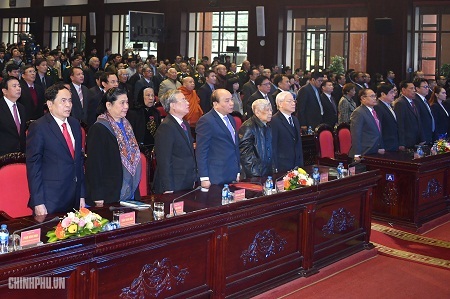 The event was attended by Party General Secretary and President of Viet Nam Nguyen Phu Trong, former Party General Secretary Le Kha Phieu, Prime Minister Nguyen Xuan Phuc, Permanent Vice Chairwoman of the National Assembly Tong Thi Phong, Permanent member of the Party Central Committee’s Secretariat Tran Quoc Vuong, President of the Vietnam Fatherland Front Central Committee Tran Thanh Man, former Party, State and Government leaders, and former volunteer Vietnamese soldiers and experts in Cambodia. Addressing the ceremony, Prime Minister Nguyen Xuan Phuc affirmed that the Vietnamese Party, State and people forever memorize the huge sacrifices of Vietnamese officials, experts and volunteer soldiers who wholeheartedly devoted themselves to the revolutionary cause of the Cambodian people. Such great sacrifices will be forever carved into the glorious history of solidarity and fighting between the two countries’ people, he emphasized. Building on the solidarity tradition of the triumph on January 7, 1979, Viet Nam and Cambodia have accelerated bilateral relations with a motto of“good neighbours,traditional friendship,comprehensive cooperation, andlong-term sustainability," the PM said, adding that the economic, trade, investment and tourism ties between the two sides are also growing vigorously. The Viet Nam-Cambodia border area, which was heavily devastated in the past war, has now become a border area of peace, friendship and mutually beneficial cooperation. The two nations’ authorized forces have been working closely together to effectively manage the border line, and have completed84% of the border demarcation and land marker planting work. For his part, Tep Ngorn emphasized that Viet Nam and Cambodia are good friends, brothers, neighbors and partners with a tradition of fighting and solidarity through many difficult and arduous periods. He extended his most sincere and profound gratitude for the huge sacrifices of the Vietnamese Party, State, Fatherland Front, army and people in helping liberate and rescuing the Cambodian people from the brutal genocidal disaster, contributing to the process of seeking peace for the country. Viet Nam’s significant, timely and effective support and aid have worked to develop Cambodia from a country engulfed in the war, grief and decay into a nation of complete peace, all-around development and unity, he affirmed./.